Yep, Amazon have put If Wishes Were Horses on special offer. I have no idea for how long, but here it is if you fancy snapping up a virtual copy. If you are interested in horses and history – and especially women’s history – I think you’ll find something to enjoy, as well as a nostalgia trip into everything from Black Beauty to Horse and Pony magazine, Jinny and Shantih and the W H Smiths’ Win a Pony competition. Christmas Confessions Competition: What Did You Do When You Were Pony-mad But Ponyless? Are you an adult recovering from a deprived, pony-mad but ponyless childhood? Did you always enter Win a Pony competitions and somehow never win even though you spent weeks swotting for the quiz answers? Does it still rankle? Did you gallop around the garden jumping over fences made from bamboo canes and flowerpots? Or eat raw oats to see what they tasted like? Was your school nickname “Horsey”? Did you pride yourself on the verisimilitude of your whinny? Have you still not recovered from reading that scene in Black Beauty where Ginger [SPOILER] ends up on the knacker’s cart? Did you cycle for miles in the rain to hang over the ropes at a horse show? Did you ever attempt to blackmail your parents into buying you a pony, because you knew that ponies only cost £10 and you could easily keep one in the garage if your dad only got rid of that stupid car? If you answered yes to any or all of these questions I think it would be therapeutically advantageous for you to take part in the If Wishes Were Horses Christmas Confessions Competition. I’m looking for a story or an image that sums up the goofy glory of being pony-mad but ponyless: the passion; the dedication; the compulsive collecting of model horses; the extremely detailed descriptions of imaginary Arabian steeds; the time you stole and sold your mum’s jewellery for your pony fund; the time your favourite riding school mount kicked your teeth out and you didn’t mind… I even want to hear from you if you eventually did get that magic pony. You jammy swine. Ahem. No, I’m FINE now, not jealous at all. Really. In that case, tell me about that pony and what he taught you by dragging you through hedges and standing on your toe while being adorable. So send your stories (250 words or there about) or photos to the email link at top right of the blog by December 15th and then we’ll have a vote. The top five get a copy of If Wishes Were Horses and everlasting glory. But sadly not a pony, because I’m still saving for one of those. 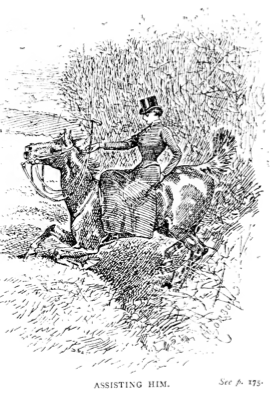 Looking For Stories About Women and Horses in the Nineteenth Century? Here’s a selection from the archives – a little bit of everything from balloonists to tragic heroines, scandalous females and zebras ridden sidesaddle. 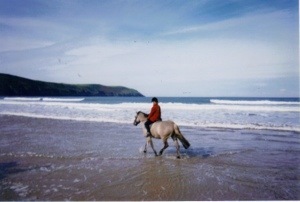 I also wrote in detail about women and girls who rode in Britain and Ireland in If Wishes Were Horses: A Memoir of Equine Obsession. A risqué (and very popular) stage hit involving an actress in a bodysuit strapped to the back of a horse: Wild Horses Dragging You Away. A former missionary to lepers strikes a blow for womankind: Mrs Hayes and the Zebra. Exposed stockings and duelling menfolk: Alice Thornton: A Regency Lady Jockey. A very genteel lady steeplechaser: Dianas of the Chase. A (Not So Short) History of Women Riding Astride. “DVD Extra” for If Wishes Were Horses’ 19th century chapter – quotations, photos: Jeunes Filles Bien Elévées. Women who defied the classic stereotype of Victorian invalid lady, a-fainting on the sofa: Para-Hunting. A intriguing and mysterious horsewoman of Paris: Who’s That Lady? Sidesaddle wardrobe malfunctions: How Should A Lady Dress? Anything men can do: Side-saddle Polo. Mrs Hayes goes to Germany: Riding in the Kaiser’s Berlin. Blanche Allarty-Molier performs the famous airs above ground: Flying Sidesaddle. The daring dressage riders of 19th century Europe: Jenny: NOT The Prix St Georges, and beautiful, tragic Emilie. Mrs Power O’Donoghue catches a maid trying on her riding gear: Upstairs, Downstairs. Sidesaddle as drag – in central London: Veiled Delusions. Madame Poitevin, a horse and a balloon: Equine Aviation Pioneers. 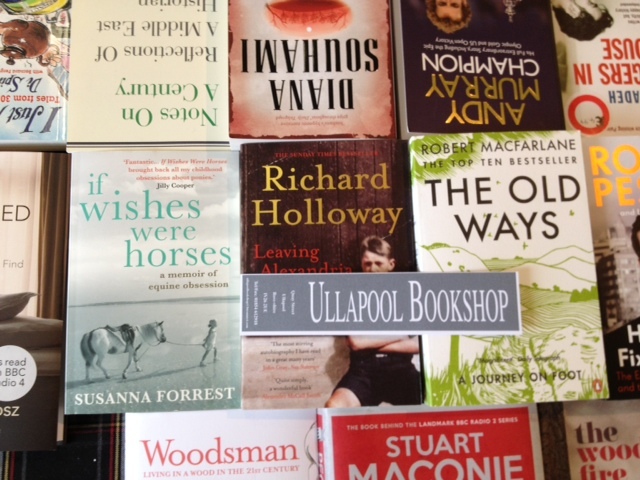 If Wishes Were Horses’ number one saleswoman – my mum – is in Ullapool making sure the local independent is stocking copies (well, actually she’s there to watch my dad in the St Ayles Skiff World Championships but never let it be said that she can’t multi-task when family interests are concerned). As you can see The Ullapool Bookshop are exactly the kind of bookshop that anyone in their right mind would want to move into, skiff or no skiff. They’re closely involved with the Ullapool Book Festival and are open a whopping seven days a week for customers coming in from the Isles.